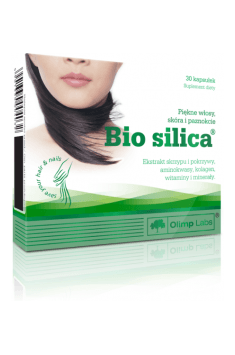 Olimp Bio silica® is a dietary supplement designed to improve the condition of the skin, hair and nails. The preparation contains extracts of horsetail and nettle enriched with collagen proteins, amino acids, vitamins and minerals. The supplement is recommended for people who complain of a bad condition of their skin, struggle with the problem of fragile, splitting and brittle nails, or experience excessive hair loss. Common horsetail (Equisetum arvense) is valued mostly for its high content of silica, which is believed to enhance and regenerate the skin, hair and nails. Horsetail extracts exhibit sebostatic and anti-inflammatory properties, reduce acne, and help to cleanse greasy skin and close pores. They can also improve blood flow in skin and improve its colour. Silicon deficiency contributes to premature hair greying, its brittleness and fragility, and weakening of the nail plate. Stinging nettle (Urtica dioica), similarly to horsetail, provides a lot of silicon as well as other vitamins, minerals and nutrients. It helps to treat acne, reduces hair loss and stimulates its growth, and strengthens nails. Collagen protein hydrolysate mainly delivers more collagen the body but it can also stimulate its endogenous production. It helps to improve skin density, positively affects its texture and firmness, and smooths out small wrinkles. Moreover, it improves the condition and durability of hair, stimulates its growth and prevents its loss. Cystine is an amino acid forming alpha-keratin, which is present in the structure of the skin, hair and nails. It has a positive effect on the condition of hair, increases its resistance to damage, and helps to close cuticle scales, making it look smoother, flexible and shiny. Moreover, it stimulates collagen production, which is of great significance to the condition of the skin. Methionine, just like cystine, is a sulphur-containing amino acid. Sulphur is crucial for the condition of the skin, hair and nails. It is an integral element of collagen, and the disulphide bonds formed by it determine the properties of keratin, the main structural element of skin derivatives (hair and nails). Zinc helps to restore the right pH of skin, improves wound healing, and reduces inflammation. It proves great in the treatment of eczema, psoriasis and acne. It reduces the activity of keratinocytes, whose excessive expression is one of the factors responsible for blocked pores and leads to the occurrence of blackheads and unsightly skin blemishes. Zinc deficiency weakens the structure of hair follicles, which leads to hair loss. Calcium plays an important role in the production of collagen and elastine as well as determines proper hair pigmentation. According to some scientific hypotheses, the element also has promising antioxidant potential, which means that by sweeping free radicals, it slows down aging processes. Vitamin E guarantees great protection from damage caused by excess free radicals. It fights the visible symptoms of skin aging, particularly those caused by UV radiation and polluted air. It helps to make the skin smoother, reduces its roughness and dryness; it also boosts epidermal regeneration. Vitamin C, similarly to vitamin E, is characterised by powerful antioxidant properties. Apart from that, it is required for collagen synthesis, which makes it an important factor for skin firmness and its resistance to damage. Moreover, it improves the condition of blood vessels, prevents the damage of capillaries and the formation of unsightly spider veins. Vitamin B1 plays an important role in collagen regeneration, which makes it important for proper skin flexibility and durability. It accelerates wound healing and epidermal regeneration. Vitamin B2 is responsible for maintaining a proper collagen level. It can reduce skin inflammation and reduce the time of wound healing. Vitamin B2 deficiency is also visible in inflammatory processes around the nose and face, the swelling of mucous membranes, and cracking lips. Vitamin B6 helps particularly with seborrhoeic dermatitis, as its deficiency contributes to inflammation in mucous membranes. It can also reduce excessive hair loss. Research shows that it can aid the treatment of hormonal disorders leading to acne. Vitamin B3 can improve the appearance of the skin by softening and smoothing it out as well as reducing small wrinkles and redness. The vitamin supports the production of ceramides, which form skin lipids, form a protective barrier, and enable proper skin hydration. Vitamin B5 helps to keep water in the epidermis, that way improving skin flexibility and hydration. It can also reduce inflammation and redness. Moreover, it helps to regulate sebum production, thanks to which it can decrease the occurrence of acne. Folic acid ensures proper epidermal turnover, which keeps the skin healthy and radiant. What is more, it helps to detoxify the organism, which in turn reduces acne and blemishes on the skin. Biotin is often called the “beauty vitamin”. It participates in the production of keratin and compounds cementing horn cells of the skin, hair and nails. Additionally, it promotes the differentiation of epidermal cells and regulates the functioning of sebaceous glands. Biotin deficiency often manifests itself through psoriatic lesions and discolourations of the skin, its excessive greasiness, hair loss, and brittle nails. Vitamin B12 helps to maintain proper skin colour and prevents discolourations and patches. Vitamin B12 deficiency often leads to anaemia, and one of the consequences of the condition is the hypoxia and malnutrition of tissues, including hair follicle cells. As a result, hair becomes thinner, brittle, and prone to falling. Vitamin A is responsible for, among other things, skin keratinisation, as well as the condition of collagen fibres. Vitamin A deficiency leads to excessive epidermal keratinisation, which makes the skin dry and rough. Additionally, it can result in hair brittleness. Vitamin D helps to keep hair thick and beautiful. A large amount of vitamin D receptors are located around hair follicles, which is why the vitamin is believed to play a big role in regulating the cycle of hair growth. Research has shown that increased vitamin D supply proves helpful in the treatment of conditions connected with excessive hair loss (scalp psoriasis, androgenic alopecia, alopecia areata, telogen effluvium). To sum up, Olimp Bio silica® is a perfect way to strengthen your skin, hair and nails. It should be considered for preventive purposes by people who have trouble balancing their diet or follow a restrictive slimming diet, which can lead to nutritional deficiencies and, as a result, undesirable changes in appearance. bardzo poprawił ogólny stan włosów i paznokci. Wyglądają znacznie lepiej, są mniej łamliwe i rosną tak szybko jak jeszcze nigdy. Godzien polecenia i wart swojej ceny. 2 capsules a day, preferably during a meal. Do not use with other products containing silicon. If used for longer period of time, it is advisable to also take vitamin B1. The best results can be obtained by using the supplement regularly for at least three months. It is worth remembering that high amounts of silicon promote the loss of thiamine, so long-term supplementation with this product would best be accompanied by a vitamin B1 preparation. When using this supplement, discontinue the use of nettle and horsetail teas. Progesterone Natural Cream can correct the hormone imbalance.